76 years, 5 months, 9 days old age. 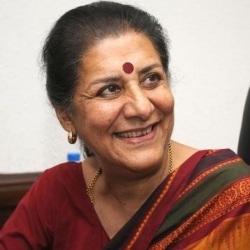 Ambika Soni will turn 77 on 13 November, 2019. Only 6 months, 21 days, 22 hours, 25 minutes has left for her next birthday. Ambika Soni has celebrated the total number of 76 birthdays till date. See the analysis by days count and bar graph. Ambika Soni was born on 13-11-1942 in Lahore in the state of Punjab, Pakistan. She is an Indian Politician. She is married to Uday Soni since 1961. She has a son named Anup Soni.